"It suggests that animals might be playing it safe around people," said Kaitlyn Gaynor, an ecologist at the University of California, Berkeley, who led the study. "We may think that we leave no trace when we're just hiking in the woods, but our mere presence can have lasting consequences." The findings are novel because "no one else has compiled all this information and analyzed it in such a ... robust way," said Ana Benitez Lopez of Radboud University in the Netherlands, who reviewed the study. "It's a little bit scary," she said. "Even if people think that we're not deliberately trying to impact animals, we probably are without knowing it." "Humans can do their thing during the day; wildlife can do their thing at night," she said. That way, people would be sharing the planet "with many other species that are just taking the night shift while we're sleeping." Rising temperatures are a confounding factor and another way people drive some animals towards being nocturnal. I don't think any wild animals (except climate scientists of course) can detect a temperature increase of 0.5 C. Also, there is no help from the night --- what is warming (data wise) are overnight low temps, not high temps. I do think the wild animals had more to fear from people when people hunted them to survive. 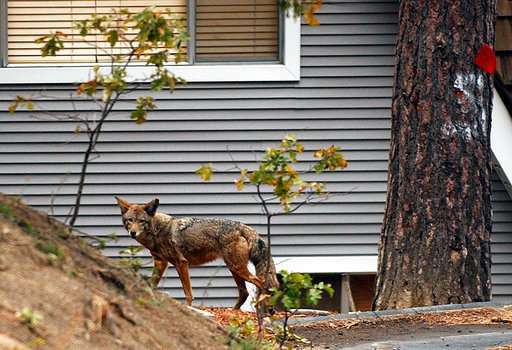 Meanwhile, many suburban areas are turning into wildlife refuges as coyotes, raccoons, bobcats, and other predators take advantage of the abundant food acquired at low risk. "what is warming (data wise) are overnight low temps, not high temps." You are a troll and a liar. The Chicken Little Jackass, ignorantly, brays.